My first approach in generating a map for Cube-Based Games. This Time it's for RedEclipse and the aim was to create a completely asymetric map (thus making it interestign to play in deathmatch) that is still as balanced as possible in Coop-Matches and should support Multi-Games. Further it shouldn't be too big, so you won't see anybody most of the time, while it shouldn't get too crowded at the same time if more then 4-5 Players connect. Currently it's pretty much playable, but Team 3/4 are still sometimes at a disadvantage in CTF/Bomb-Games. I will adress that in comming releases. For people interested to check it out there is a server running on g33ky.de too. Just type "/connect g33ky.de" and have fun! I don't want to be harsh, but If you just look on the screenshot, then it really appears as a map which isn't worth it to really check out. It seems like you took a break of about 5 years, the standards of quadropolis has been raised a lot compared to the old days. So observe some (starred) contents to get a feeling what the standards are today. well.. if you think it isn't worth it, then don't do it. 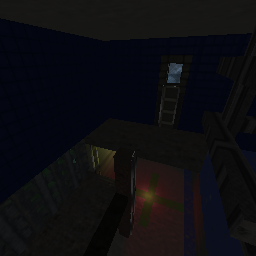 My intend wasn't to build the best map ever, but to have some fun playing around with cube. If you don't like what i built then that's completely fine with me. So what do you expect how one should you react to your comment? "Oh my map isn't as good as others, i should stop to build maps!" "I build crappy maps, i should start to build good ones"
Personally I would say the second statement, but it's not about what I think in this case (neither anyone else actually). Quadropolis is mainly intended to share wisdom, creativity and many more within maps, mods, scripts, models, skyboxes and many more content; instead just dumping the map on Quadropolis and hoping for some comments of how to do something better or just on a different way (which fits the wisdom part). When a content is just of such low quality compared to the stuff which people are mainly seeing, then it's not very plausible people tend to check out your content, as it looks worse as average from the first sight already. That's why I suggested you to observe other maps to get an indication of the requirements of how a map should look like today.